Did you ever hear the one about the small town barber near Dallas? For years his was the only place to get a haircut in town. All the folks who lived in this little town loved him and he had a nice thriving business. Until one day a kid from the local highschool decided he was going to become a barber too. Our hero didn't really mind the competition... after all it was a local boy and the town had grown to the point that there was plenty of business to go around. So he decided to meet with the kid and give him some pointers. At that meeting the kid was more than respectful and receptive to his wisdom and at the end of the meeting he asked the kid only one favor... "please don't undercut my prices". He explained that he had charged the rate of $15 for a haircut for years and it allowed him to keep his shop open and provide for an income for his family. 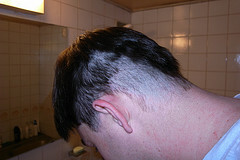 On top of that, he explained, it is a fair price for a good haircut and that cheap haircuts are never any good. The next day he noticed that the kid not only was opening a shop right across the street from his, but that there was a huge sign in the window that said: "Haircuts Only $10". Undaunted our hero started work on the sign for his window... it said simply "We fix $10 haircuts". I tell this story today because I have noticed many small business owners and especially non-profit groups around Dallas taking the cheap way out when it comes to their website. All too often I hear someone I am meeting with say "my cousin's friend's brother's dog-sitter is a web designer and he said he would do it for $100", or when it is a non-profit group; "one of our volunteers makes websites and will do ours for $200". It never fails that a few months to a year later I get a phone call from that same person saying that they had problems and now needed our services. Even worse is when I hear that they are going to do it themselves with some free online website builder and they wind up making a "good enough" website and never get professional help at all. This situation is truly unfortunate for many reasons. They lost customers: Your website is going to be the first impression many of your customers will have... what is the "good enough" website you had done on the cheap saying to your prospects in their first impression of your company? In trying to save a few bucks initially these folks wind up costing themselves far more than what they saved initially. If not in actual dollars and cents, but at the very least in their valuable time being spent on something other than the goals of the organization. Your time is valuable, your money is finite, your prospects and customers are precious... make sure you are investing wisely on all fronts. If not with Your-Web-Guys, then at least with some professional group that can help you make sure your investments of time, money, and marketing are smartly done.